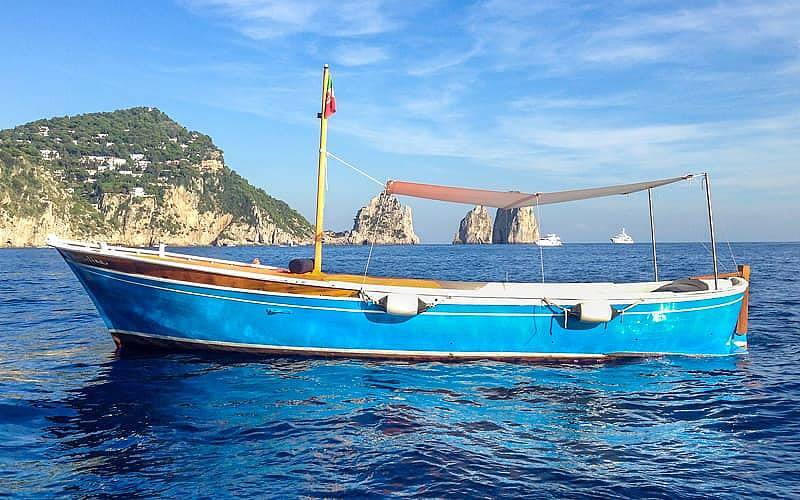 Discover the breathtaking island coastline of Capri, Italy by sea with a private boat rental or tour from Capri Blue Boats, offering the most relaxing and romantic sails along the coast! 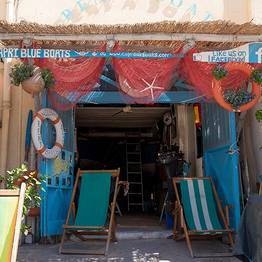 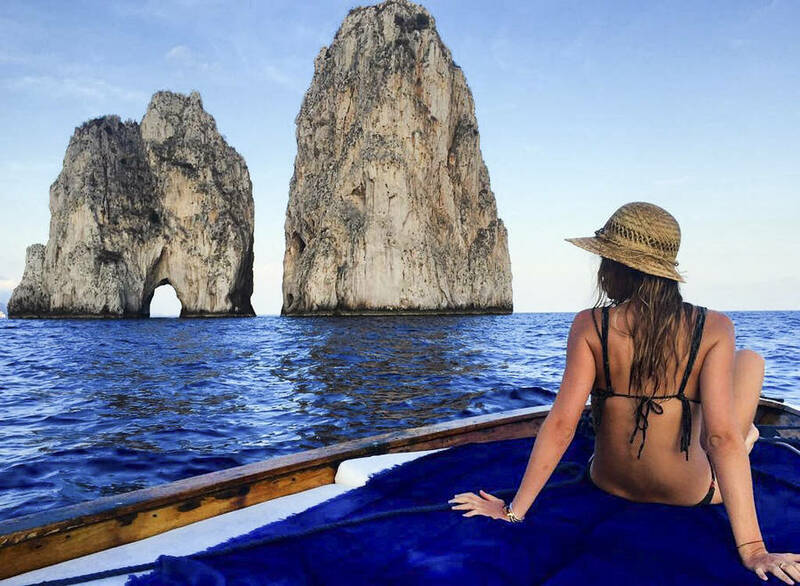 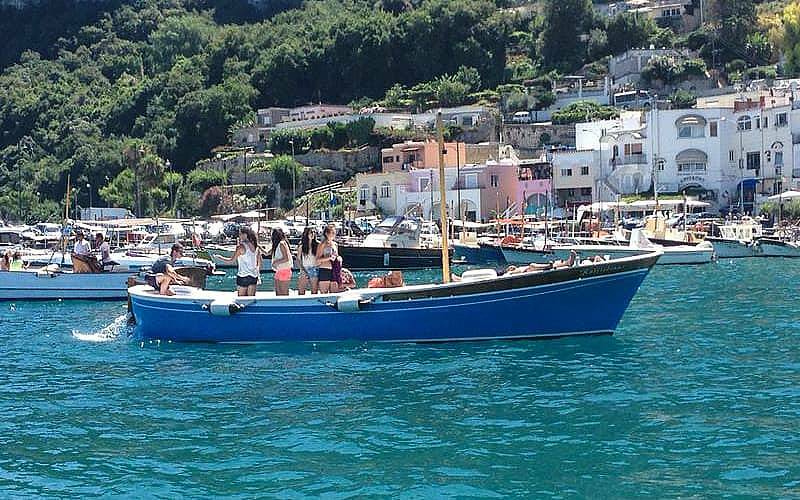 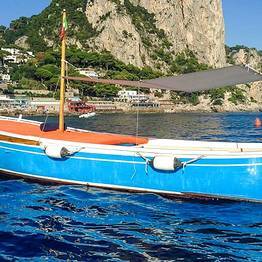 Capri Blue Boats is only boat tour and rental company on Capri based in Marina Piccola, the sleepy coastal village just a few minutes sail from the Faraglioni sea stacks but far from the maddening crowds of Marina Grande. 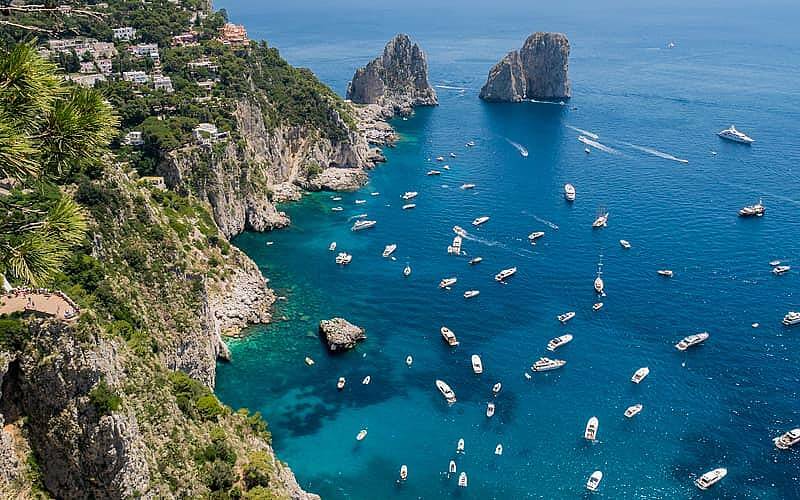 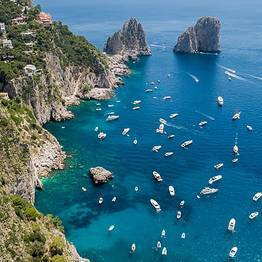 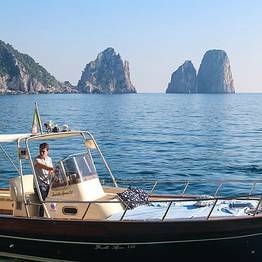 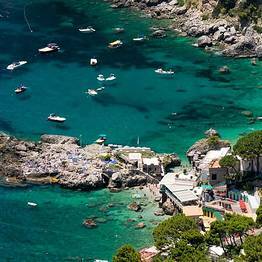 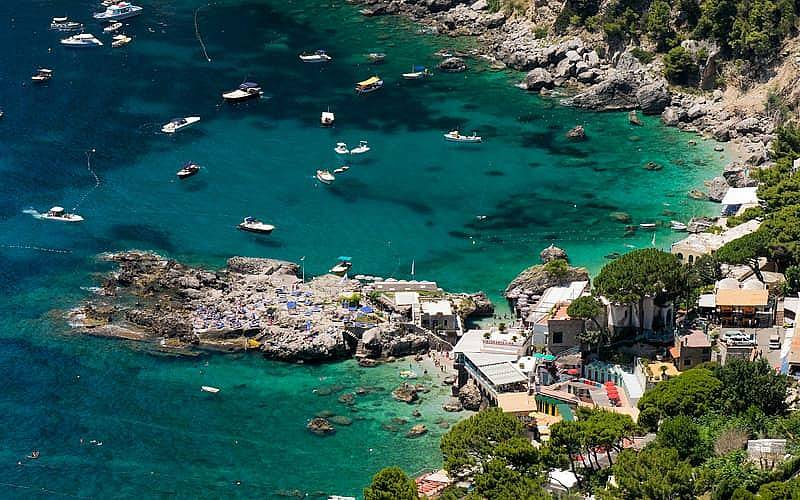 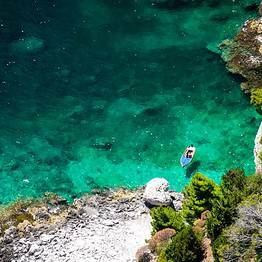 Marina Piccola is perfectly located to set sail along the dramatic southern coast of Capri, near the Faraglioni and some of the most picturesque sea caves along the coastline. 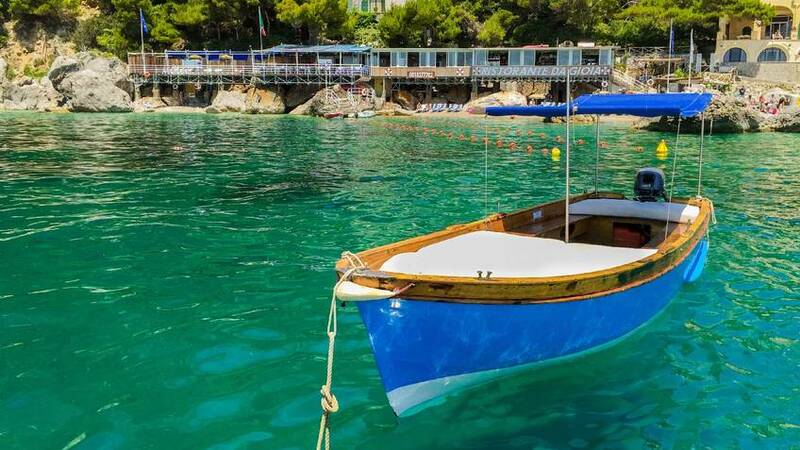 The local beach is perfect for a swim before or after your sail, and a number of pretty restaurants along the waterfront are excellent lunch spots. 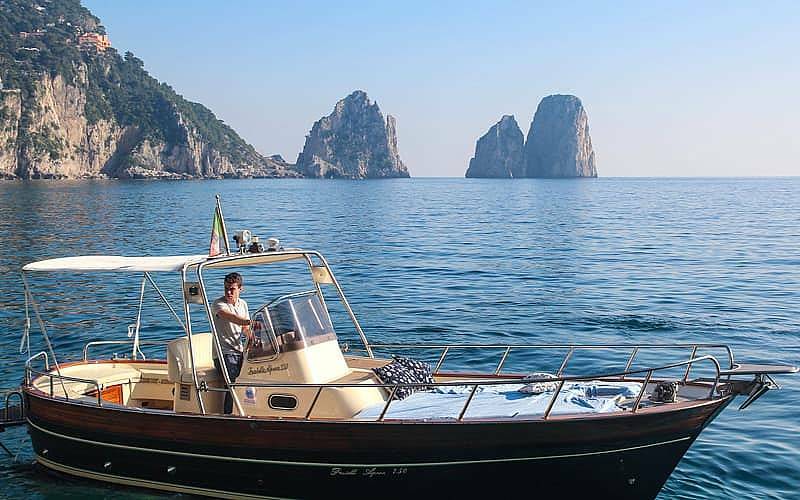 If you want to explore the coast in complete independence and privacy, you can rent a romantic Lancia Caprese without a skipper! 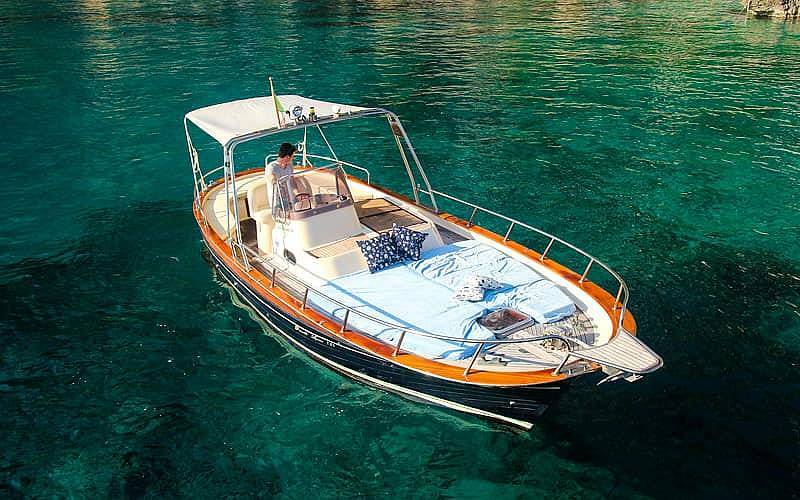 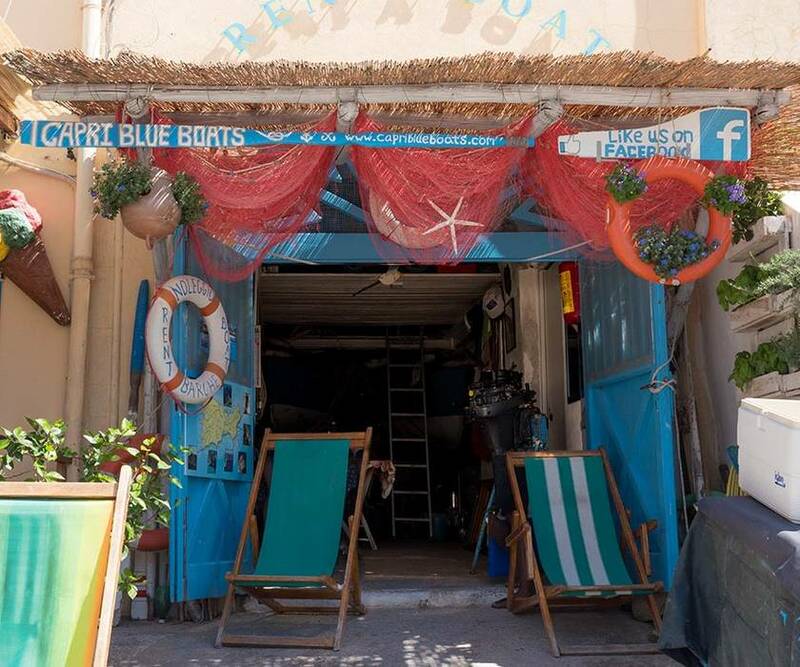 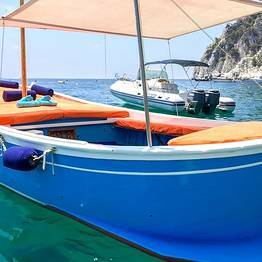 For a completely relaxing sail dedicated to basking in the sun and bathing in the turquoise waters of the Mediterranean, leave the navigation to someone else and opt for hiring a traditional "gozzo" boat with a skipper included. 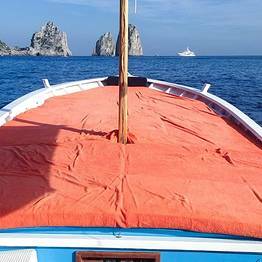 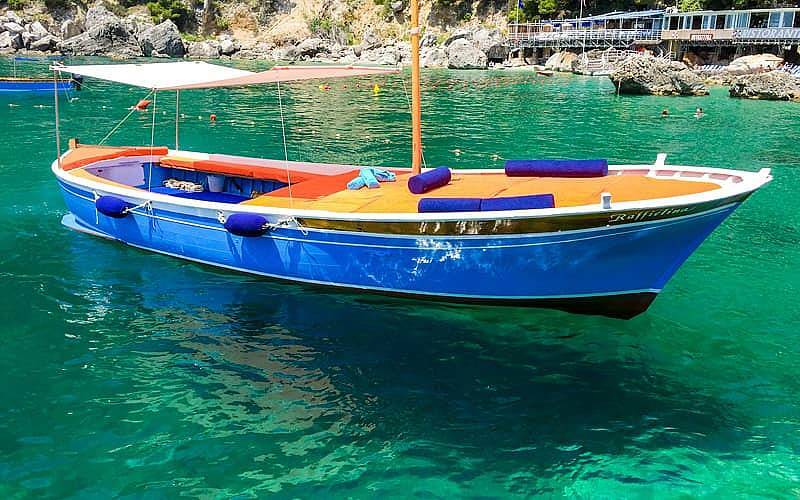 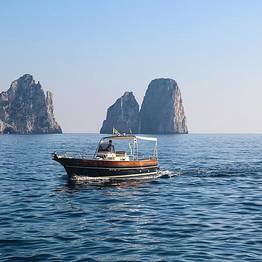 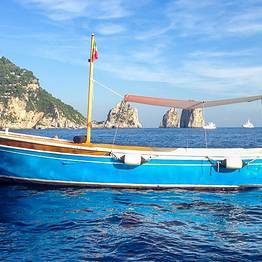 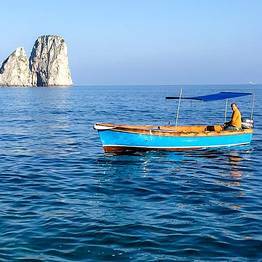 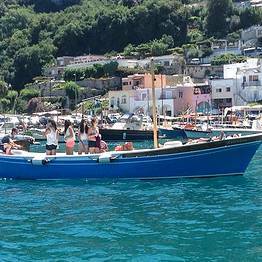 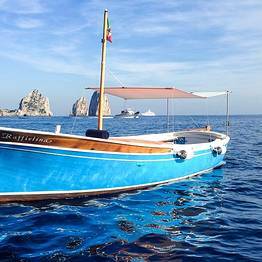 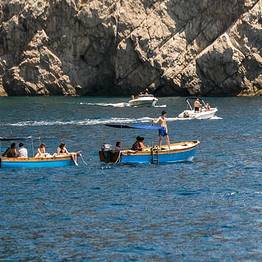 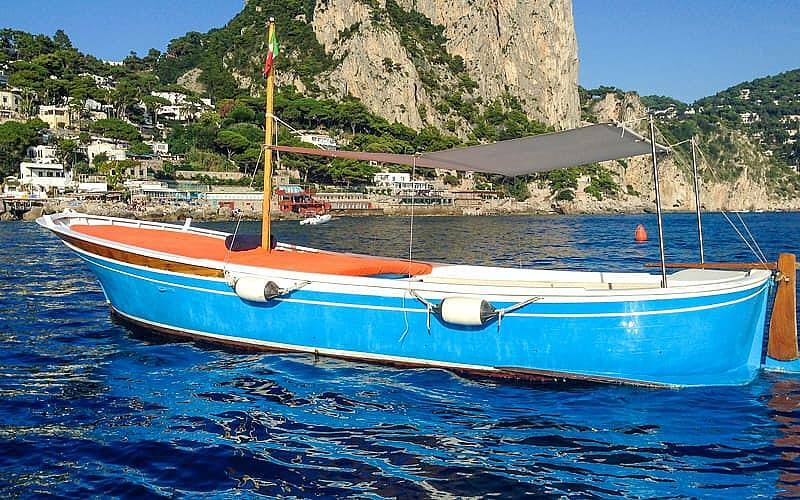 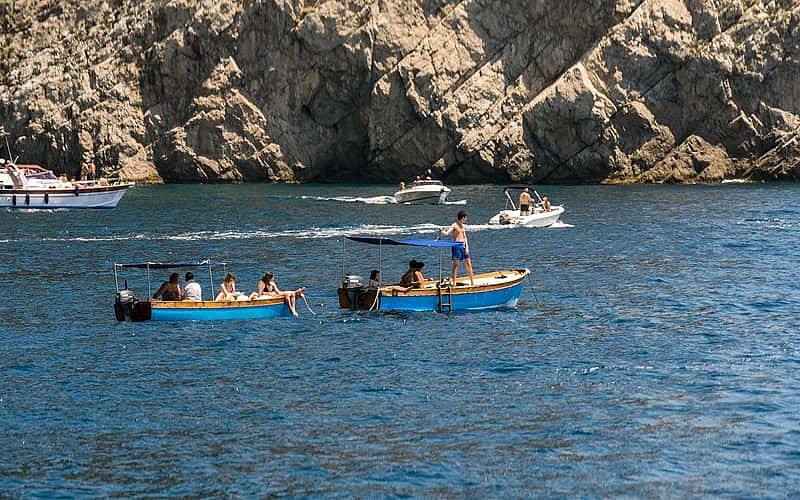 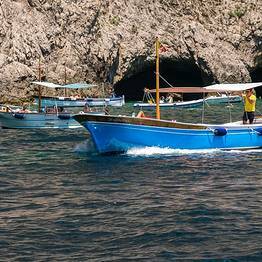 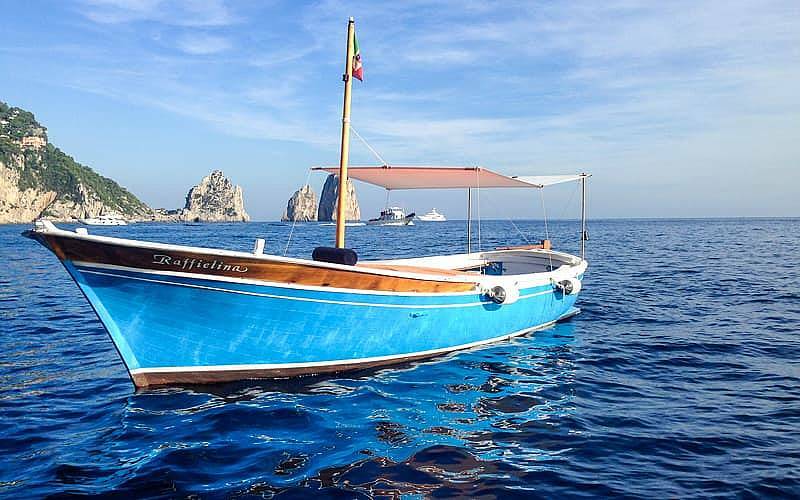 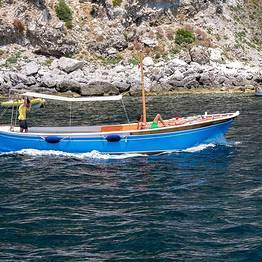 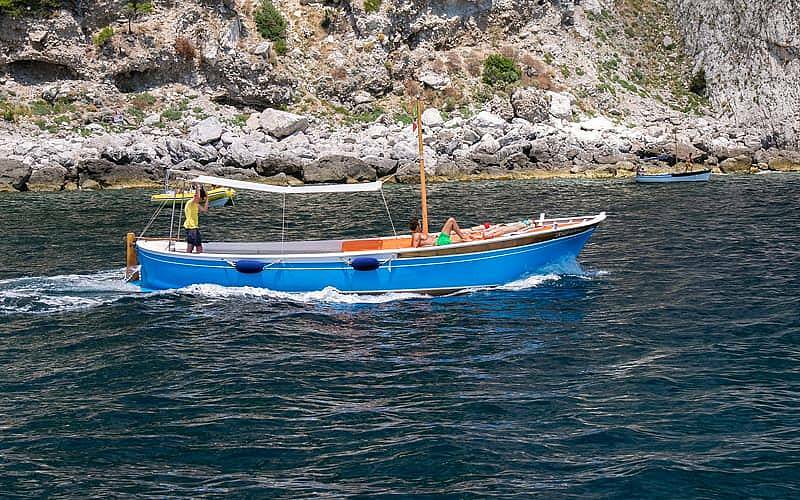 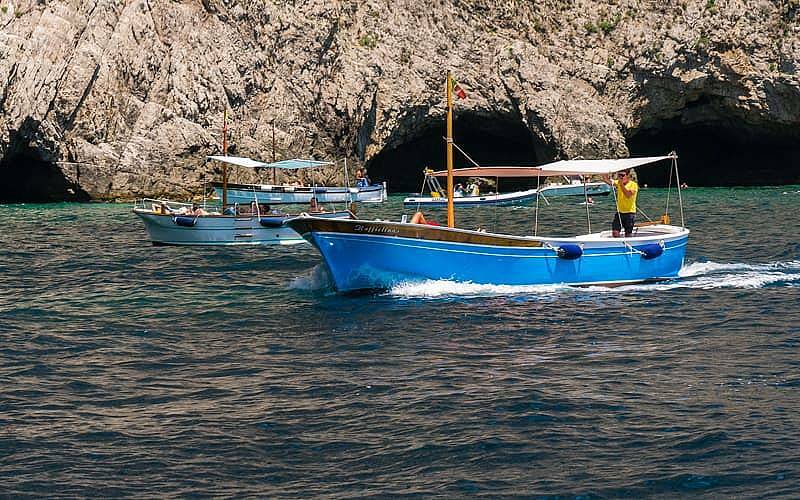 Capri Blue Boats offers traditional wooden island boats, called a "gozzo" or "lancia", for the most picturesque and comfortable sail possible. 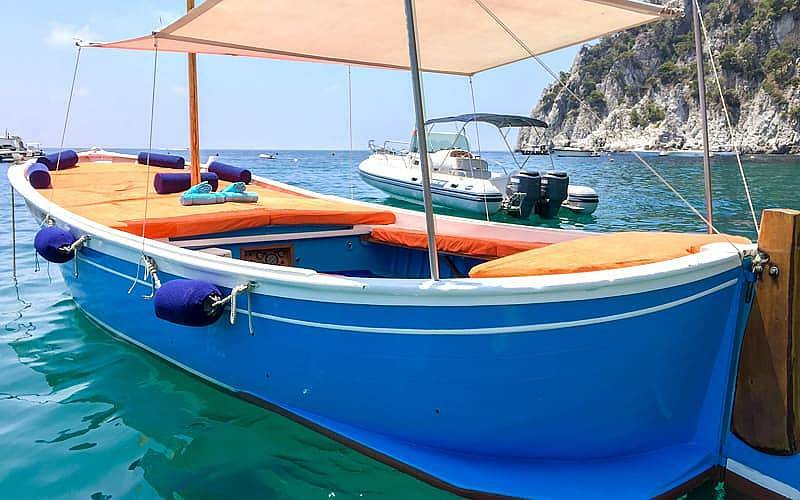 Boat rental include everything you need, from an ice chest stocked with beverages, towels, showers, and even music and snorkeling masks (upon request), for an unforgettable sail be it for 2 hours to a full day. 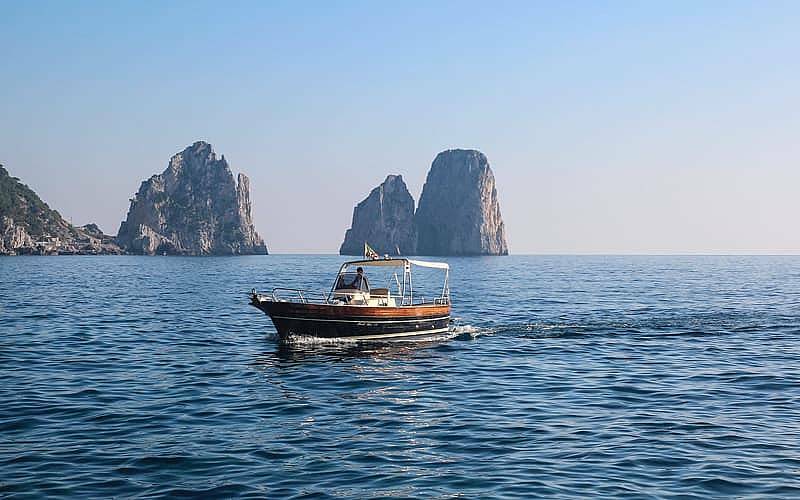 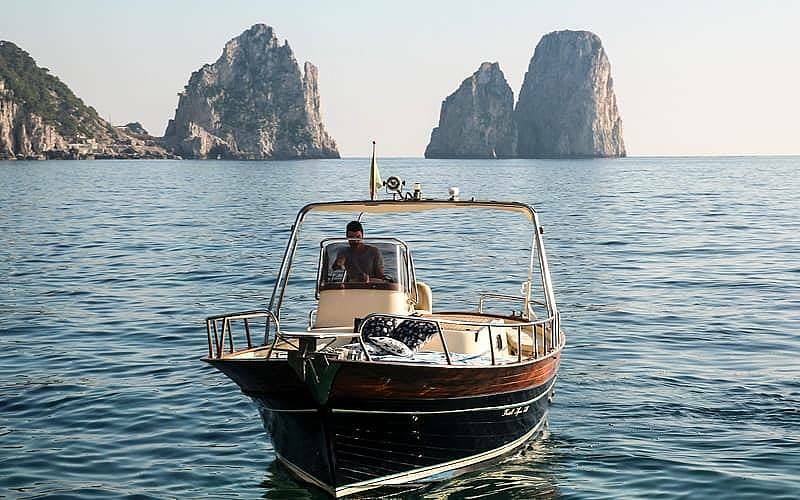 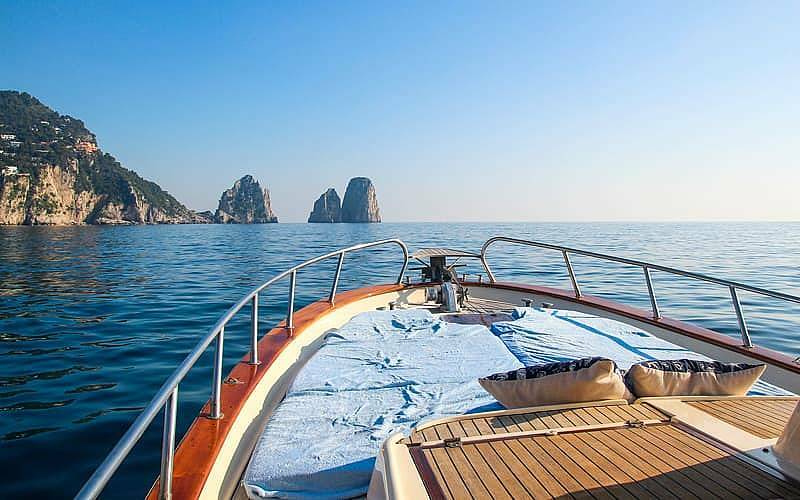 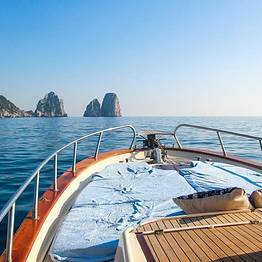 Explore the postcard-perfect coastline of Capri or the nearby Amalfi Coast from the large padded sundeck or under the cool sun awning, dive in for a swim at the foot of the Faraglioni sea stacks, or party with friend and family on board for a special occastion. 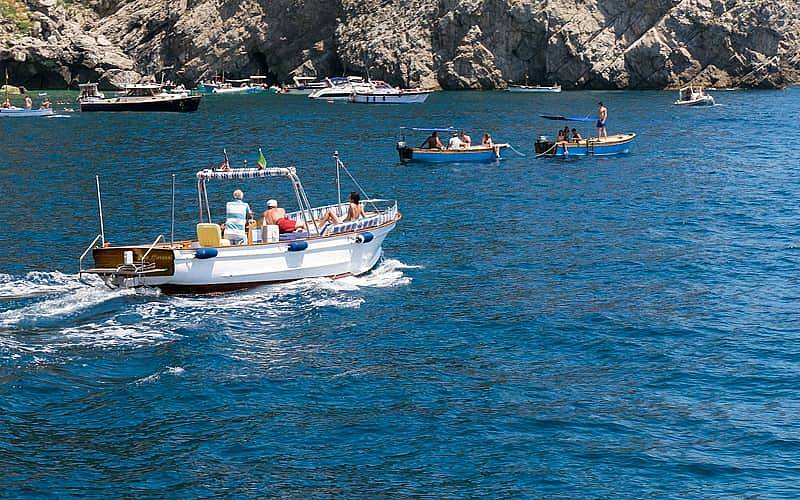 Our experienced skippers guarantee the perfect day at sea for all our passengers! 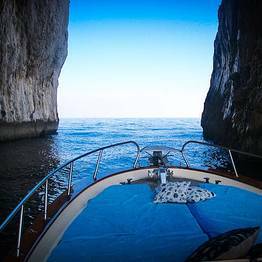 If you'd like to create a custom itinerary by sea, just contact us with your request and we can begin to plan your dream sail! 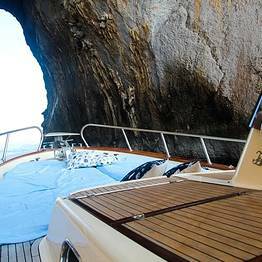 A day on board a Fratelli Aprea gozzo with skipper to visit Nerano, Li Galli, Positano, and Amalfi with towels, snorkeling masks, bathroom, shower, and free drinks on board. 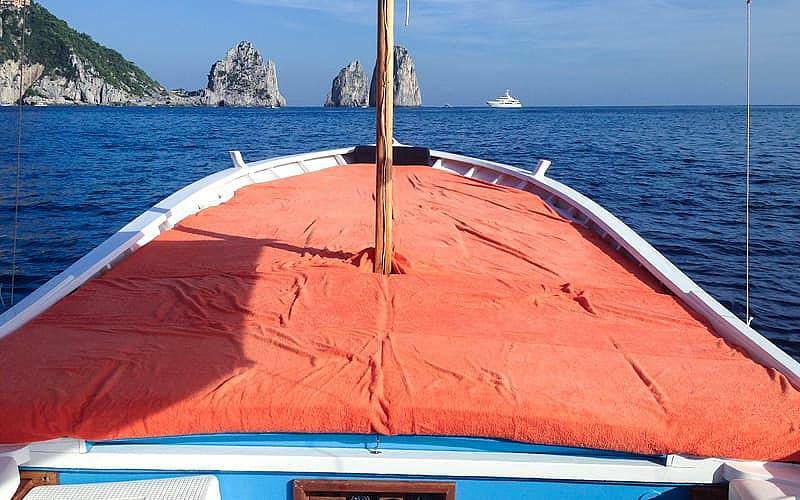 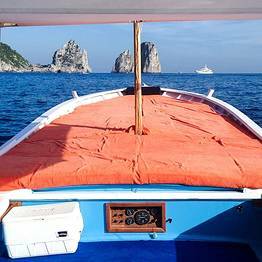 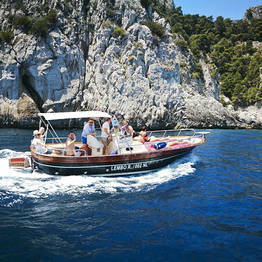 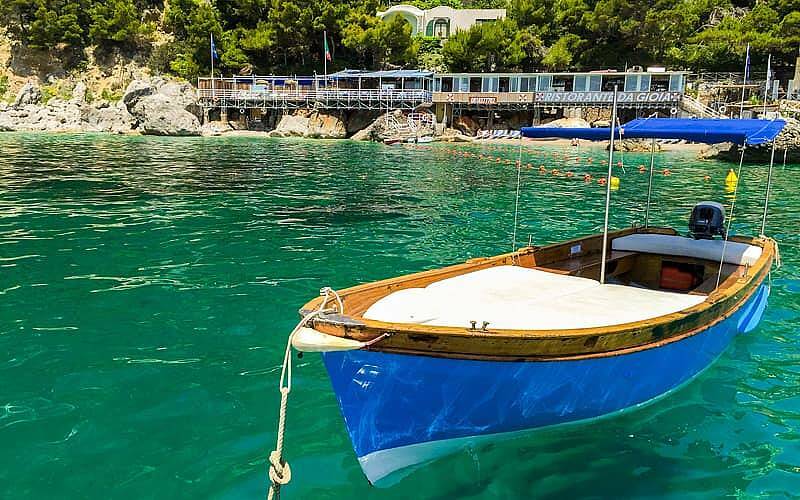 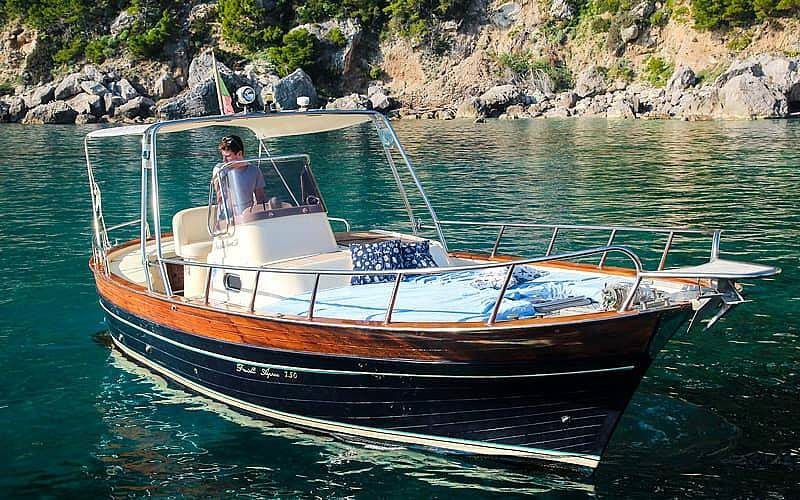 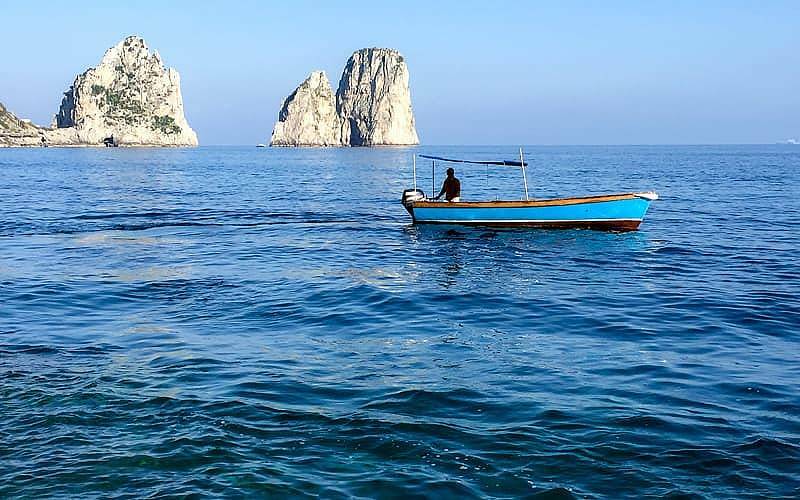 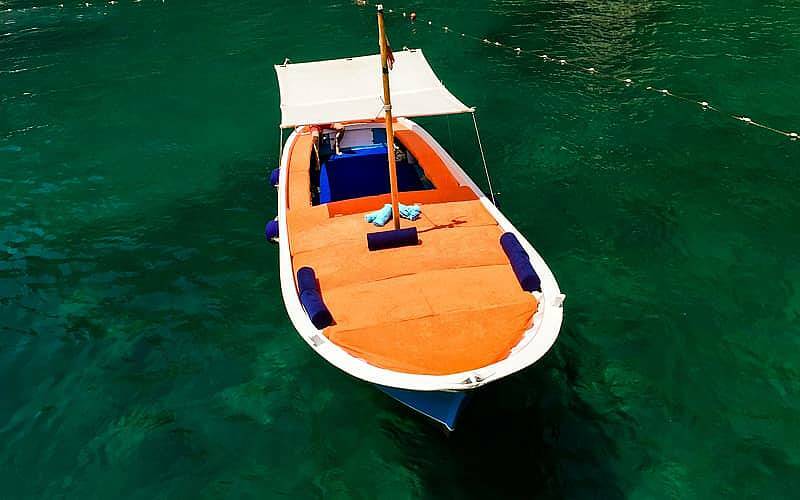 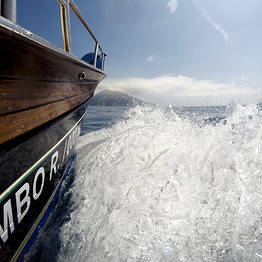 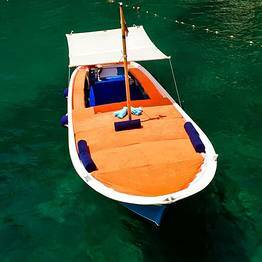 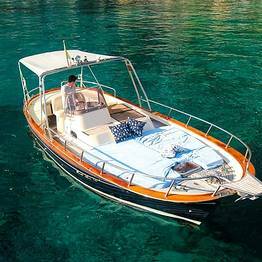 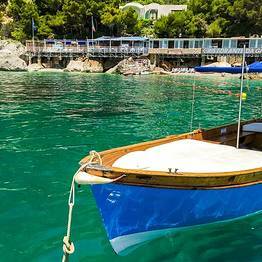 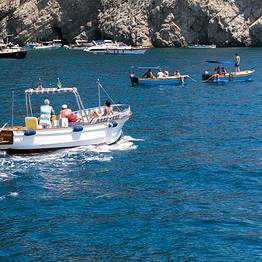 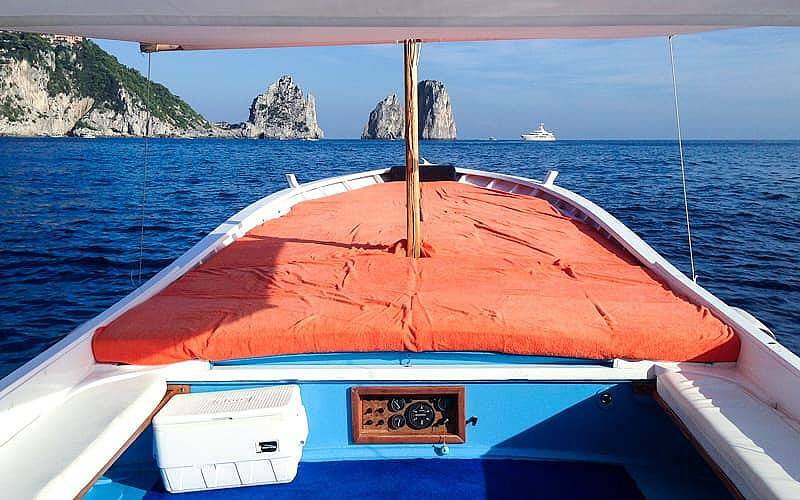 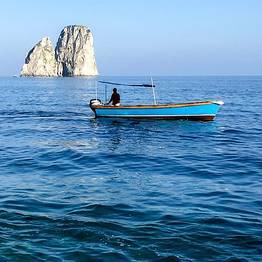 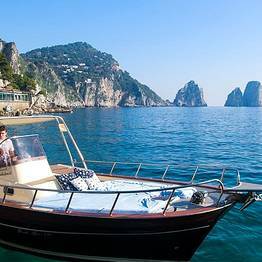 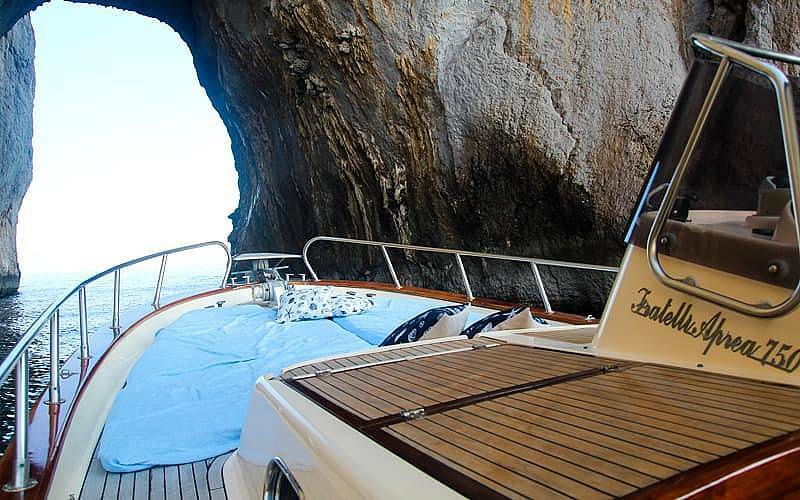 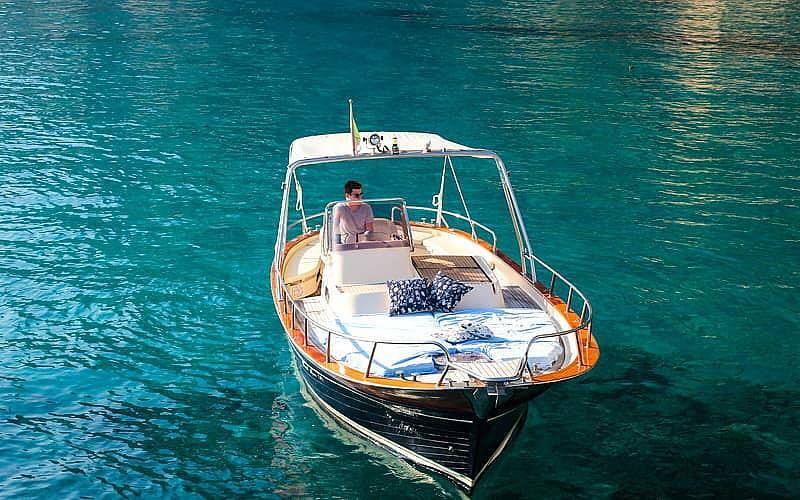 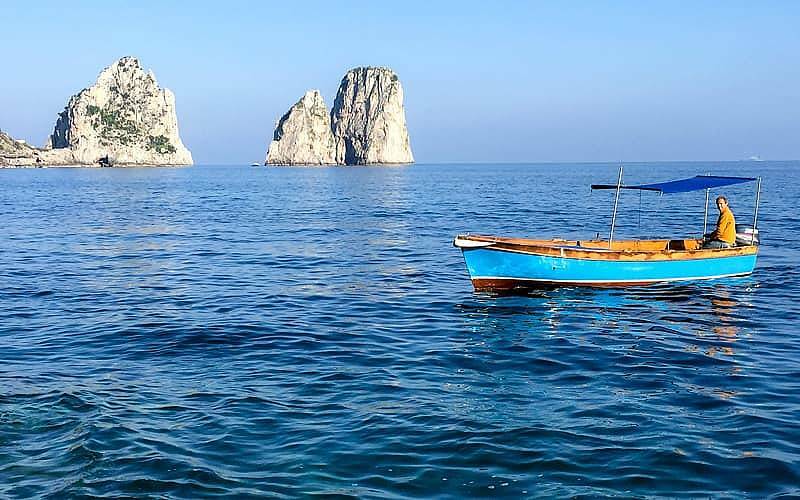 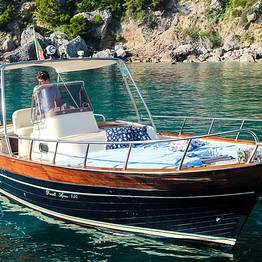 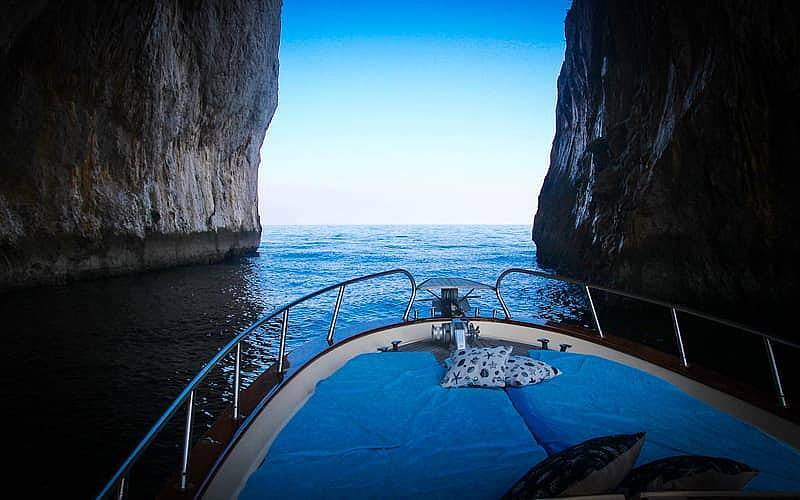 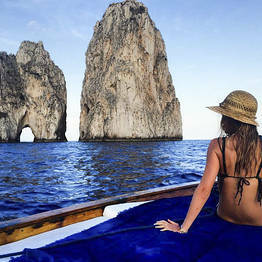 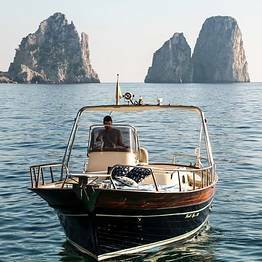 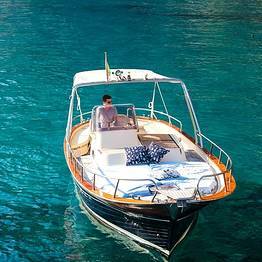 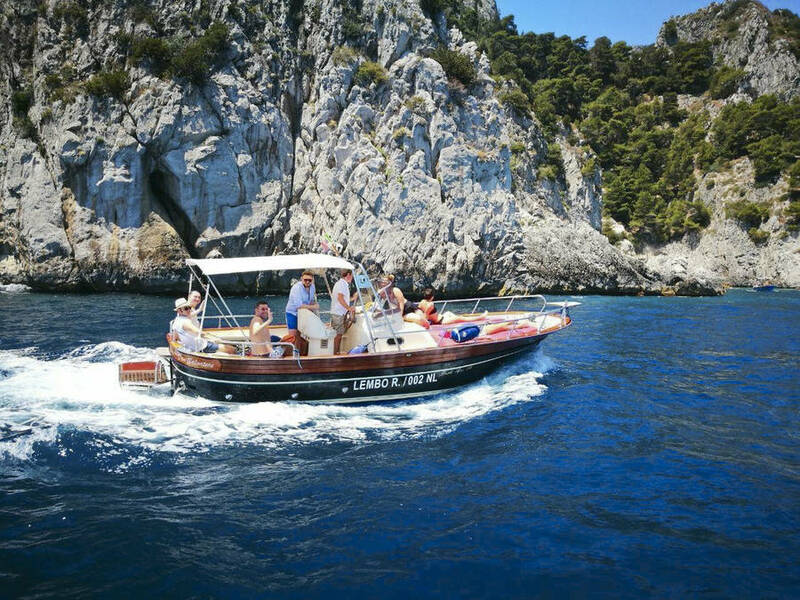 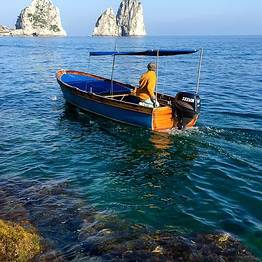 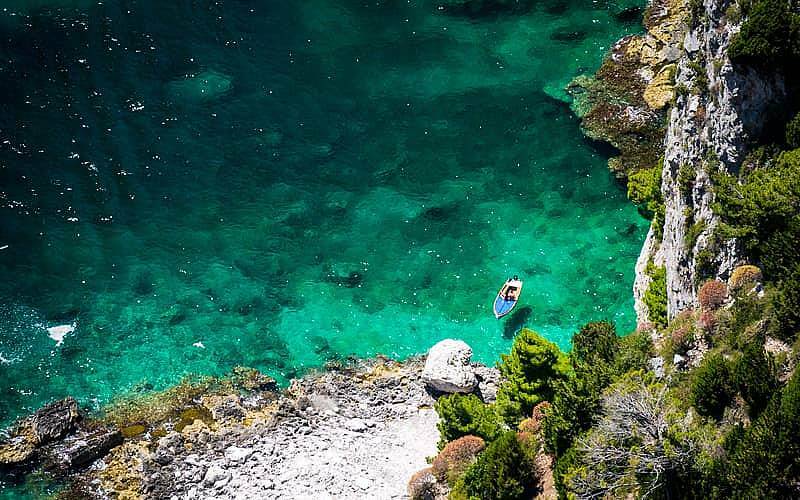 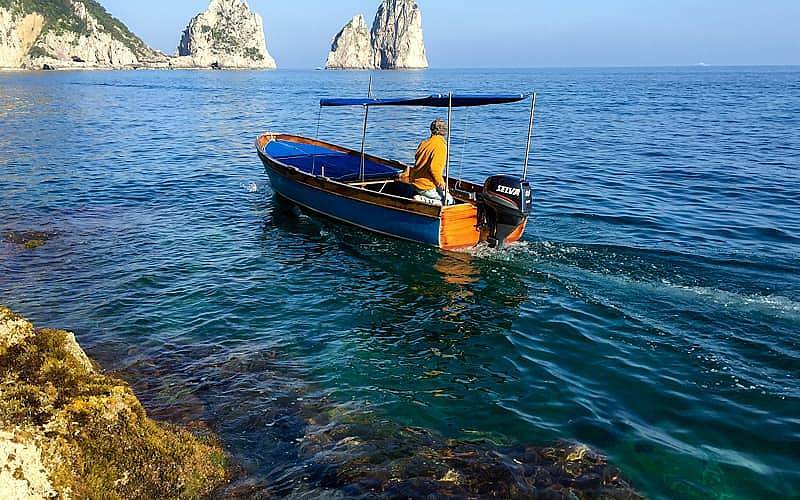 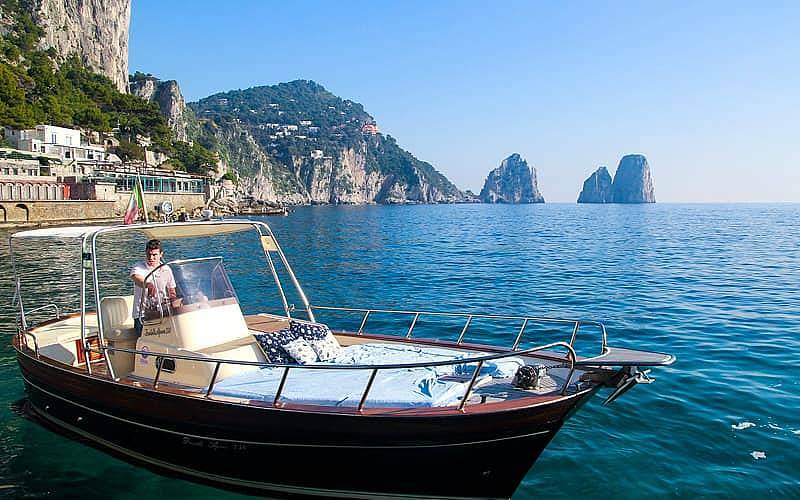 Sail around the Island of Capri in your own dinghy!